Well, stranger things have been tried...and worked. 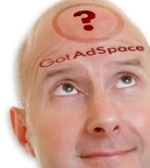 Modeling itself after eBay, GotAdSpace has launched and aims to be the middleman (apparently instead of ad agencies and sales rep forms) between advertisers and...the general public. Yes, the site aims to make it possible for people to sell ad space on whatever it is they have...to anyone who wishes to buy it. Yes, exchanges like this have been around forever but it seems this one wants to make it possible for the average Joe to get into advertising and make some money. It's not so far fetched. With people becoming more aware of advertising, using it on their blogs, podcasts and pages to make a few bucks as well as the rise of social media and pay per post-style ad models, everyone's getting in on the ad game. Why not a network to make it easier?